Scene Setting: Screens everywhere? We’re used to that nowadays. iPhones are an extension of the human body; and our digitally-saturated minds don’t even have the time to find it disturbing. But when those screens take the shape of stacked vintage televisions as the only light illuminating a darkened catwalk with its pretty images, they suddenly become menacing. That was Miu Miu’s food for thought, delivered through a collaboration with London-based artist and photographer Sharna Osborne. Known for her lo-fi, vintage video-like images, for Miuccia Prada she had filmed an array of colourful flowers, smiling girls and half-naked teenagers. 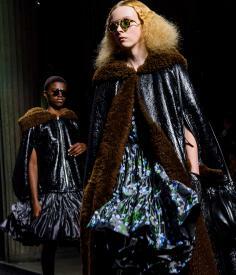 Best in show: The theme of the collection was equal parts sugar-coated fairytale and gothic nightmare. At Celine, Hedi Slimane has decided to present his most grown-up collection to date, whereas Miuccia Prada has taken over adolescent codes of dressing, creating transparent organza baby doll dresses paired with chunky cardigans and camouflage prints, peppered, of course, with Miu Miu’s trademark sparkling details. Even if the most statement-making pieces in the collection were capes, which came in a variety of wool, velvet, shearling and Barbour-like waxed canvas that will appeal to customers of all ages. As much post-apocalyptic protection as Little Red Riding Hood, they crystallized the spirit of a collection that, in the midst of school climate change strikes, felt very much like a metaphor of our times.